For long, the major grouse of Myanmar�s ruling junta was that while India stood tall in talk, it was small on delivery of its promises. In diplomatic circles, India was often referred to with the derisive acronym NATO � No Action Talk Only. In a first, the Punjab and Haryana High Court has reinterpreted provisions of the Prevention of Corruption Act to hold that public servants, who can be removed by the subordinate authorities other than the government, are not entitled to protection of sanction. 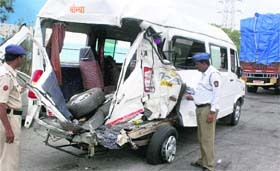 Twenty seven members of a marriage party died and 26 others received serious injuries in a bizarre road accident on the Mumbai-Pune expressway at around 1 am today. Police personnel inspect the ill-fated vehicle. Another young tiger was found dead in the Kishanpur Sanctury of the Dudhwa Forest Reserve in Lakhim Khiri district barely four days after the carcass of two tigers was found in Haripur range in Pilibhit district. With the number of ex-servicemen and consequently their dependents increasing day by day, Defence Minister AK Antony has sought an increase in the number of seats reserved for wards of serving and the retired defence personnel in educational institutes. Girls outshone boys in the CBSE Class XII results declared today. While girls posted a pass percentage of 82.51, boys lagged behind at 75.8 per cent. The overall pass percentage also took a marginal dip this year, slipping to 80.19 per cent from last year�s 80.88 per cent. Students aspiring for admissions to all centrally-funded technical institutes (CFTIs) in the country, including the IITs and the NITs, will be required to take only one entrance test from 2013. Accordingly, the Joint Entrance Exam (JEE) for admission to IITs and the All-India Engineering Entrance Exam (AIEEE) for admission to NITs and other engineering and technical colleges will be scrapped.